This week I needed to investigate and fix some bugs that customers behind proxy servers were experiencing in Octopus Deploy. 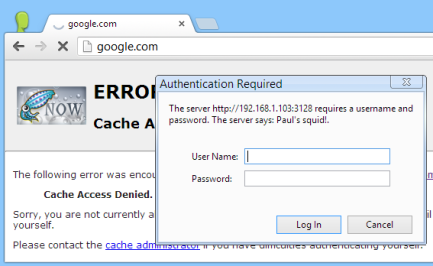 I didn't have easy access to a proxy server, so I decided to set one up using Squid, an open source web proxy server. I've seen Squid used in many shops before but this is the first time I'd ever configured it. I use Windows 8 day to day, and although Squid appears to work on Windows, I wanted to set this up in a clean environment. So I created a new virtual machine in Hyper-V, and installed Ubuntu Server 12.10. I worked through the installation guide, selecting the keyboard layout, timezone, and so on. When prompted for packages, I only chose to install OpenSSH server. This actually installed Squid 3.1.20, so my Squid configuration file was located at /etc/squid3/squid.conf. Next, I tested whether Squid worked out of the box. 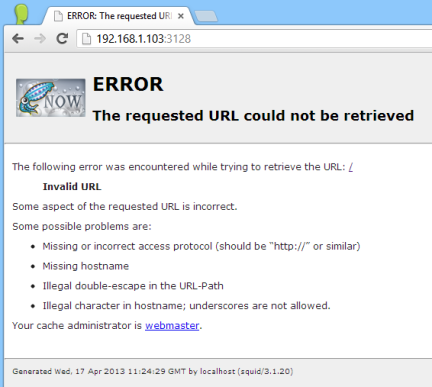 I used ifconfig to find out my VM's IP address, then opened that in a browser on port 3128. I was given a page that said Squid at the bottom, so that's a good sign. Next I created a file called users in my Squid configuration folder, with a user named paul. For me the output was /usr/lib/squid3/ncsa_auth. auth_param basic realm Paul's Squid! Not long after this, I discovered that Fiddler (which acts as a proxy) can require authentication. It's as simple as checking Rules -> Require Proxy Authentication. D'oh! The following guides were very useful in getting this working. The main differences I found was that when I installed Squid, I got Squid 3.1.20, while the guides appear to use an older version.